Are my baby's Apgar scores relevant to our birth injury case? Together, these criteria make up what is known as an Apgar score. Each of the criteria may be assigned a score of zero to two for a possible total of 10 points. 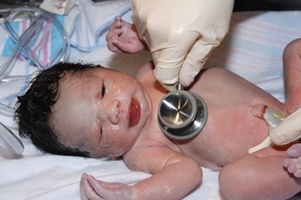 At one minute, scores of seven or higher typically mean that the baby needs routine post-delivery care, scores of four to six indicate that the baby may need assistance, and scores for three or less indicate that the baby may need emergency intervention. After five minutes, any score below a seven means that the baby should continue to be monitored and retested every five minutes for up to 20 minutes. Low Apgar scores do not always indicate a birth injury. However, if your child has been diagnosed with a birth injury, it is important to share your child’s Apgar scores with your birth injury lawyer. A low Apgar score could be indicative of a birth injury. For example, if your baby lacked oxygen during labor or delivery, your baby could have low Apgar scores. While not all low Apgar scores mean that a birth injury occurred, it is important information for your legal team to know if you suspect a birth injury. It may be evidence of negligence. Doctors and nurses have a responsibility to provide reasonable care for infants with low Apgar scores. If your child’s Apgar scores should have led to further monitoring or treatment and medical staff failed to provide it, your child may have been hurt by medical negligence. Apgar scores are just one piece of evidence that may be important in a birth injury case. If your child was hurt during labor or delivery, you need to know about all of the relevant evidence and about how to protect your child’s recovery. Has Your Family Been Impacted By A Birth Injury? If your family has been impacted by a birth injury you need to speak with an experienced birth injury attorney as soon as possible. Contact us online or call our office directly at 888.450.4456 to schedule a free consultation. How Much Does it Cost to File a Birth Injury Case? ?I'm traumatized by my baby's birth injury. If I file a claim will I have to testify in court? ?What is an obstetrician’s standard of care? ?How long do I have to file a birth injury claim in Kentucky?